I frequently think a baked potato would go great with a meal I’m about to eat… but I’m hungry now. I can’t wait for a potato to bake. 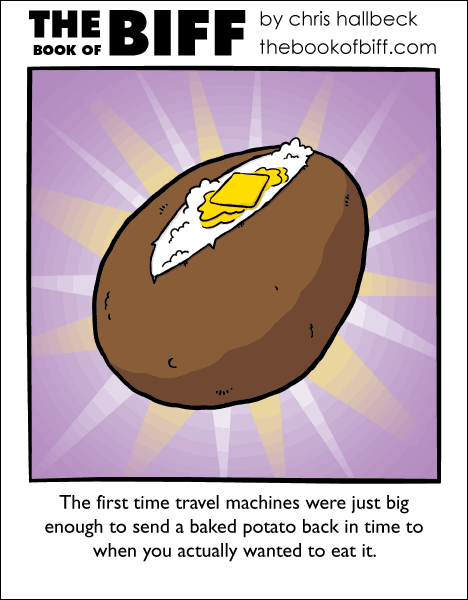 Even then, it seems like a real waste of energy to run that huge oven for a single potato. I sometimes resort to microwaving them but it’s never quite the same. a baked potato when you actually want it is the greatest magic of all. Hey, good food takes time. Yes, time. I thought about making a “thyme machine” joke, but meh. Hehe, I got a potato story. I was sitting at my computer, potatoes in the oven at like 400 degrees. After a while, a thought crossed my mind that maybe I should cut a slit in the potato to vent the steam, but I went “Nah, what are the odds?” Less then five minutes lately, I hear this loud “FWOMP” come from the oven, I turn around and see the oven door close. The potato had exploded with such force that it rattled the door. I went to inspect it and the potato had not only exploded, but had completely escaped its skin. Best tasting potato I ever had. This is why proper planning and timing when making meals is important. That way all the food is hot and ready at the same time. The secret is to boil the potato around 45 mins in it’s skin (until soft) Then Microwave for a minute or two, add cheese, bacon, sour cream and eat it til it’s GONE. Chris, when you really want that baked potato, you can use the microwave and then Broil it in the oven to crisp it up. You don’t have to wait for the oven to preheat and waste all that energy.